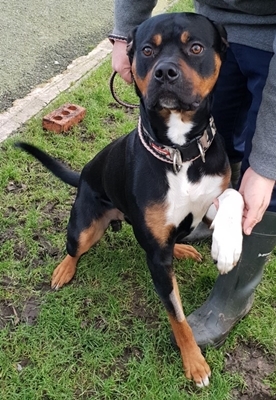 Published 9th February 2019 at 276 × 400 in Dogs Looking for Homes. ‘Cerberus’ 2 year old Castrated Male Rottweiler Cross.. Cerberus came to the Home as a stray so his background is unknown. He has been to a home but had to be returned as he was protective over the male partner and had become a concern to the female partner. He has been housetrained and had got along with the other dogs he met, though he was not keen on a neighbours cat coming into his garden! Because of the information we have we think Cerberus will have to go to a home with no children and with a preference for males.